I am just about to head out to the gym to do my squat exercise for the day. Perhaps I should write this after I get back, but that might be a bit too late, so I thought I would give you all some food for thought now. I am the first to admit that I am somewhat terrified of the squat exercise. Why? Mainly because I tore my medial meniscus doing the squat exercise about 10 years ago. If I remember right, I was lowering or coming back up slowly, and I am almost pretty sure that I never did the squat below parallel as I have seen suggested and have been doing off and on for a year. Having said that, on the other hand, the squat exercise is hands down my favorite. How can it be my favorite? I know that every time I push myself to go to the gym and do the squat exercise, even when I do not want to, even when I do not feel as flexible as I want, I know that nevertheless, I will soon see and feel the benefits of squats. To me it seems somewhat miraculous, because I know that if I get in a good workout tonight, even though it is fairly light I am sure by most workout standards, I will see an improvement in my definition and body composition. I will feel stronger, I will look stronger, I will see a reduction in bodyfat percentage, I will even feel more confident in handling other challenges outside of the weight room. This has happened every time that I have been consistent in doing the squat exercise. The reason that I am talking up squats so much is that I want to make the point that other than the squat and pushups and deadlifts, I am not doing much of anything else, but I am seeing very good improvements in my muscle tone. What is the point of spending 2 hours in the gym doing machine exercises and not seeing much improvement, as I have done in the past, doing machines and then treadmill and elliptical, when I can spend 30 minutes in the gym, do the squat exercise only, and reap more benefits than I have with any other exercise in my experience (outside of the deadlift). Granted, I am not a bodybuilder by any stretch of the imagination, I am just a regular guy doing his best to get into shape, the best shape that I can. Mark Rippetoe’s quotation from Starting Strength is a timeless reminder of how to prioritize strength training. If you want to be strong, ditch the machines and pick up a barbell. Rippetoe based this statement on his experience with countless athletes. The evidence of experience is powerful, but until now it’s all we had to support the idea that free weight squat exercises provide better results than machines. An upcoming study in theJournal of Strength and Conditioning Research tackled this question. Researchers asked, “What type of exercise will elicit the most hormonal response – machines or free weights?” They chose the leg press exercise and back squat exercise to duel in an epic test of which could produce the most testosterone and growth hormone. Ten healthy men volunteered for the study, each with experience in strength training. On one day they performed six sets of ten reps of leg press, starting with 80% of 1Repetition Max. On another day, after plenty of rest, they returned to the lab to perform the free weight squat exercise workout, which was also six sets of ten reps, starting with 80% of 1RM. During each of these workouts, the participants were sporting a catheter inserted into their arms so blood could be sampled quickly. In a result that surprised no one, the barbell squat exercise produced significantly higher levels of testosterone and growth hormone. At the greatest difference, which occurred during the workout, testosterone was about 25% higher when performing full squats versus leg press. But the difference in growth hormone was incredible. The Squats Exercise produced a full 200% more growth hormone during the workout. Even thirty minutes after the workout, participants who did squats exercise still had 100% more growth hormone as when they performed the leg press. Double your growth hormone, double your fun? Cortisol levels also rose more after the squat exercise workout, further confirming that the squat workout was a fundamentally different physiological experience from the leg press machine workout. So is the leg press a bad exercise? No. Any exercise that results in a positive adaptation isn’t bad. The question is one of efficiency. We all want to get the best results possible, but we have limited time and energy to devote to training. So it makes sense to use your time and energy on exercises that provide the best bang for your buck. And is the leg press as effective as a full squat exercise? Not a chance. So, now I know why I feel so great during and after doing free weight full squat exercise. Squat exercise produced a full 200% more growth hormone during the workout and even 100% more growth hormone thirty minutes after, you can see who the King is. Therefore, if you want to maximize your workout and the potential body transformation available to you, it is clear that you should attempt and learn how to do the squat exercise. Just to make sure that you are doing it right, I am going to provide you with a link that I used to start doing the squat exercise. 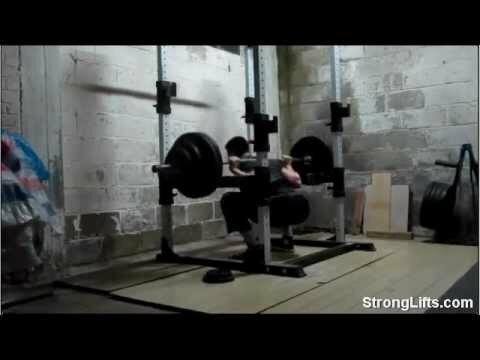 It is of Mehdi of stronglifts, he has a great site and pdf book which will definitely inspire you to do the squat exercise as well as several other core body movements, and his writing and site https://stronglifts.com was definitely motivational to myself, so you might like it as well. Update: I got to the gym, warmed up with 45lbs, 5reps twice, then did 5 sets of 5 reps with 75lbs with between 2 and 5 minutes of rest. Rich is a certified personal trainer-AAPT and the author of ZEHHU: Crossing the Bridge from Depression to Life. At the age of 55, he lost 75 pounds in 6 months. Go here to read his story and see how he did it. Feel free to send Rich a message here. What Are the 5 Components of Fitness? Do you think it is possible to reboot your fitness? Remember when you were in shape back in the day? Do you think that rebooting your fitness is a pipe dream? You are in the right place if you want to get back into shape, but do not know where to start. Hashi Mashi™ Diet and Training is Designed for Informational Purposes Only & Does Not Provide Medical Advice, Treatment or Diagnosis. Copyright © 2019 - Hashimashi.com - All Rights Reserved - Hosted by BIGSCOOTS - The Greatest Hosting On Earth-For Real! that I used to trim 18 inches off my waist in 6 months. This free guide is a roadmap for your own fat to fit transformation. What do you have to lose, other than your belly?